WTAERLOO, IOWA – On Friday, Sept. 21, and Saturday, Sept. 22, the Loras College hosted the American Rivers Conference at Byrnes Park in Waterloo, Iowa. The tournament was made up of singles and doubles matches, each with their own brackets. Representing Loras in the A-Singles bracket were senior Charlie Harries and first-year Trevor Hamilton. Hamilton, a newcomer to the team, made his way up through the brackets, beating two Luther players in a 6-1, 6-0 match and a 6-3, 7-5 match. He then beat a Coe player 6-2, 6-2, claiming his spot in the finals. He ultimately lost to another Coe player in a 6-2, 6-2 match, awarding him his spot as runner-up of the bracket. Participating in the B-Singles bracket were first-years Joe Schneider, Sage Klar, and Riley Collins, sophomore Ryan Scheidt, and senior Sean Baldwin. 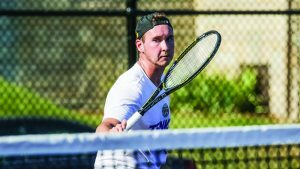 Baldwin, a veteran player of the team, represented the team well by defeating a Wartburg player 6-1, 6-1, followed by a University of Dubuque player. Baldwin lost in the quarterfinals to a Coe player, claiming third place for the team. 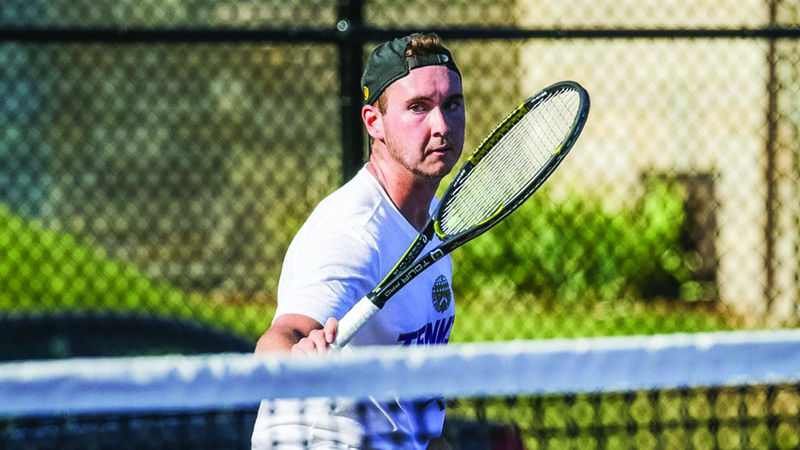 Senior Charles “Chuck” Harris played No.1 during doubles and added a victory to his career. In the C-Singles bracket were first-years Tommy Linkenheld, Konner Barth, Joe Diedrich, and Brett Battkoff, sophomores Connor Pivnicka and Sam Brickley, junior Michael Runde, and senior Joe Janouch. Loras was represented well in this bracket, for Barth, Pivnicka, and Diedrich and all made it into the quarterfinals. Barth defeated Diedrich 6-1, 6-1, but lost to a Coe player 6-3, 5-7, (10-6) in the final, giving him the runner-up award. Pivnicka lost to the same Coe player 6-3, 6-1, and defeated Diedrich, giving him third place and Diedrich fourth place. The duo of Harries and Hamilton represented the Duhawks in the A-Doubles bracket of the tournament. The pair won their first match against a Coe team, beating them 8-6. The team was defeated by a Luther team in the quarterfinals, losing 8-2. In the B-Doubles bracket, Loras had multiple teams playing. The groupings were Pivnicka and Schneider, Linkenheld and Klar, Diedrich and Battkoff, Collins and Barth, Scheidt and first-year Kevin Blomquist, senior Riley Michel and Baldwin, and Janouch and Brickley. 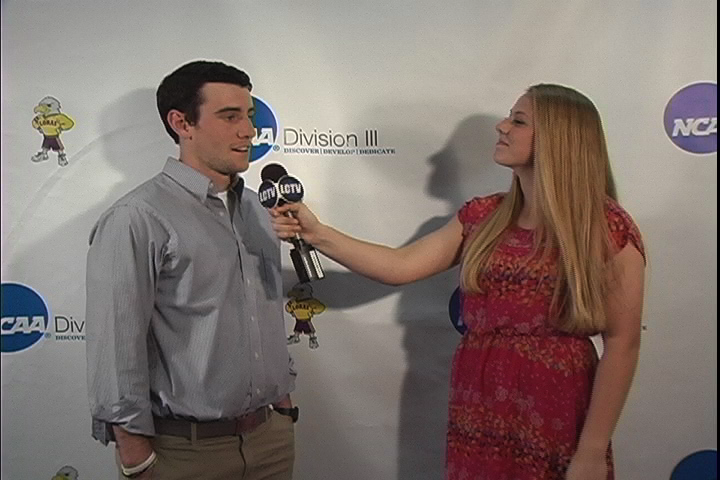 Both the first-year duo of Linkenheld and Klar and the senior duo of Michel and Baldwin made it into the semifinals. Linkenheld and Klar were defeated by a Central team in an 8-5 match, placing them at fourth. Michel and Baldwin were also defeated by a Central team, their match ending with the score 8-1, and were given the runner-up award. The men’s tennis team took home multiple awards from this tournament, showing just how skilled the team is this year. The next big event on their schedule is the ITA Regional tournament. If the men continue to play the way that they did in the American Rivers Conference, then there is no doubt that it will be a good tournament for them.